Dunay panagsumpaki ang Biblia: Kay giingon man: “Ug mibangon (si Jose) ug gidala niya ang bata ug inahan uban kaniya sa kagabhion padulong sa Ehipto. Nagpabilin siya didto hangtud namatay si Herodes. Sa namatay na si Herodes… gikuha niya ang bata ug iyang inahan ug misulod sa yuta sa Israel… ug mipuyo sa lungsud nga ginganlan og Nazareth,” (Mat. 2:14-15, 19, 21, 23). “Ug sa natuman ang mga adlaw pagpaputli sumala sa kasugoan ni Moises, ilang gidala ang Bata sa Jerusalem aron ihalad sa Ginoo. Ug gidala nila ang tanang gisulti sa balaod sa Ginoo namauli sila sa ilang kaugalingong syudad, ang Nazareth,” (Lukas 2:22-39). Dili ba dako kayo ang panagsumpaki sa report sa duha ka Ebanghelista? WALA gayod kini magkasumpaki, ka yang hitabo sa paghalad sa bata ngadto sa Templo mao ang ikawalo ka adlaw nga lagda sa balaod nga ang bata ihalad ngadto sa Templo. “Sultihi ang mga anak sa Israel sa pagingon: Ang babaye nga manamkon ug magaanak og usa ka anak nga lalaki, nan, magmahugaw siya sulod sa pito ka adlaw… Ug sa ikawalo ka adlaw pagasirkusidahan ang unod sa yamis sa bata… ug magahalad siya og usa ka nating karnero nga may usa ka tuig ang panigon alang a halad nga sinunog, ug usa ka kuyabog nga salampati o usa ka kuyabog nga tukmo…” (Lev. 12:2-2, 6). Ug human maitabo sa paghalad sa Batang Jesus misunog ang pagpadamgo sa anghel kang Jose aron molayas siya, ang Bata ug ang inahan padulong sa Ehipto kay buot man si Herodes mopatay sa Bata. “Ania karon usa ka anghel sa Ginoo nagpakita kang Jose pinaagi sa damgo ug miingon: Bangon ug dad-a ang bata ug inahan uban kanimo ug kagiw kamo ngadto sa Ehipto. Ug pabilin didto hangtod sultihan ko ikaw, kay si Herodes nagpangita sa Bata sa paglaglag Kaniya,” (Mat. 2:2-13). Busa dakong sayop ang pag-ingon nga duna kini panagsumpaki. Sino Ba ang Babae sa Revelation 12? 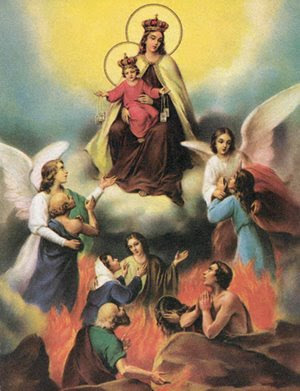 ” The epistles has taken from the apocalips,a woman surrounded by the sons splender who is wearing a crown by the twelve star and the moon beniete her feet.Appears to saint john avoice announce that is hour salvation of the kingdom of jesus christ,The application to the IMMACULATE VIRGIN of LORDES is clear. A woman,this WOMAN is NOT the BLESSED VIRGIN! o sa catholic bible ng douay rhimes version na hindi raw si virgin marry ang babae sa revation 12:!? Salamat sa comento mo sa amin, naway ang Dios ay gagabay sa iyo at sa iyong pamilya sa mga pag-araw araw na Gawain. NIV Compact Dictionary of the Bible (The Zondervan Corporation-OMF Literature Phil. Page 504-505 (emphasis added) -REVELATION, BOOK OF THE (Gr. Apokalypsis, an unveiling). Sometimes called the Apocalypse. This is the last book of the Bible and the only book of NT that is exclusively prophetic in character. Pretest- holds that Revelation is simply a picture of conditions prevalent in the Roman Empire in the late first century, cast in the form of vision and prophecy to conceal its meaning from hostile pagan. Historical view contends that the book represents in symbolic form the entire course of church history from the time of writing to the final consummation, and that the mystical figures describe in it can be identified with human events in history. Futurist- on the basis of the threefold division given in Revelation 1:19, suggests that “what you have seen” refers to the immediate environment of the seer and vision of Christ (1”9-19), “what is now” denotes the churches of Asia or the church age they symbolize (2:1-3:22), and “what will take later” relates to those events that will attend the return of Christ and the establishment of the city of God. Idealist or Symbolic school treats Revelation as purely a dramatic picture of the conflict of good and evil. The New Jerome Bible Handbook, Page 310. The Apocalypse (Revelation) narrates extraordinary visions that concern things normally unseen and unheard by human beings. It is unique in the New Testament, but not the ancient world… The Revelation has two focuses: Secrets of the cosmos and secret of the future. Secrets are revealed in order to present a particular interpretation of the times and to persuade the hearers or readers to think and live in a certain way. Sa nasambit natin sa itaas, mapapansin natin na ang Revelation ay may maraming interpretations batay na rin sa bumabasa. Atin pong talakayin ang Revelation Chapter 12 na basihan sa iyong katanungan. Dapat nating malaman na ang Revelation 12:1 ay isang fusion imagery o ang topiko ng Revelation ay may maraming kahulugan at nakadependi ito sa History, Phrase, Sentence, Context, at Interpretation ng mambabasa (Ang reference ay nasa itaas). Holy Bible- Douay Rheims Version, Page 295 –Apocalypse 12:1 Footnote -“A woman. The Church of God. It may also, by allusion, be applied to our blessed Lady. The church with the sun, that is, with Christ. She hath the moon, that is, the changeable things of the world, under her feet: and the twelve stars with which she is crown, are the twelve apostles: She is in labor and pain, whilst she brings forth her children, and Christ in them, in the midst of afflictions and persecutions. The New Testament of the New American Bible, Page 626– Revelation 12: 1f. 4-6 Notes: “The Woman adorned with the sun, the moon, and the starts symbolized God’s people in the Old and New Testament; Gn 37, 9f. The Israel of old gave birth to Messiah (v 5) and then became the New Israel, the church, which suffers persecution by the dragon (vv 6:13-17). Revelation a Divine Message of Hope by: Fr. Bruce Vawter, CM. ((Catholic Information Service, Knights of Columbus Supreme Council, New Haven CT 06521-1971)) – (Imprimatur John F. Whealon, Archbishop of Hartford) Page 44 à “The first sign is “a woman clothed with the sun; with the moon beneath her feet and the twelve starts in a crown about her head. As we see from the complete description of this woman (12:1-2, 5-6), she is both the Church and the Mother of the Messiah. The Church is presented both glorified and in her period of trial, all at once… The Child to whom the woman gives birth in v.5 is certainly Jesus, as He is describe in the messianic language of Psalm 2:9. Kaya kung ang buong chapter sa Revelation 12 ang pagbabatayan natin iyan po ay hindi kay Santa Maria lamang nakabasi o nakatoon peru kung pagbabasihan natin ang Literal na ina ni Cristo na nag panganak sa kanya hindi rin mali na e-apply natin ang Revelation 12:1 kay Santa Maria. o sa catholic bible ng douay rhimes version na hindi raw si virgin marry ang babae sa revelation 12:!? CONFRATERNITY-DOUAY VERSION, PAGE 272- REVELATION 12:1 FOOTENOTE: A woman: this woman is not the Blessed Virgin, for the details of the prophecy do not fit her. The prophesy pictures the Church of the Old and New Covenants. The beams of the divine glory clothe her, the moon is beneath her feet, she is crowned with a crown of twelve stars, and she must bring forth Christ to the world. By accommodation the church applies this verse to the Blessed Virgin. Samakatuwid nais ng may akda ng CONFRATERNITY-DOUAY VERSION na hindi lamang dapat nakatoon ang pagkakaintindi (ng mga Katoliko) sa Revelation 12:1 kay Santa Maria sapagkat ang pinag-uusapan na “BABAE” sa boung chapter 12 ng Revelation ay hindi ni SANTA MARIA naka sentro. Nasagutan po ang inyong tanong.